As discussed in the “Skype’s Core Applications” section of Experience Skype to the Max, one of Skype’s unique technologies has been its royalty-free SILK audio codec that provides crystal clear audio on Skype-to-Skype voice and video calls. However, Skype also submitted SILK to the IETF to request its addition to IETF standards as one element of Internet infrastructure that allows software developers, hardware vendors and service providers to work towards common interoperability standards for voice and video communications. The podcast in this post provides an example of the clarity that comes when using Skype for iPhone over a 3G or WiFi wireless connection compared to the narrowband audio heard on a standard phone call on a wireless carrier’s voice channel. This is the kind of goal that drives our engineers at Skype. We hope that the fact that Opus is now a standard will mean that it will be more widely adopted, helping us in our mission to deliver better quality as part of improving communications for the Skype community no matter the platform or device…. … We believe that Opus is the first codec with state-of-the-art performance for any type of audio signal and any application (communications, streaming and storage) under any condition. Because Opus was designed for the Internet, it can adjust seamlessly on-the-fly between any of its operating modes to adjust to variations in available internet resources, whether moving from 3G to WiFi or competing with the house next door for broadband bandwidth. Fundamentally Opus is a fusion of Skype’s SILK codec technology for voice with Xiph.Org’s CELT codec for music. It includes the infrastructure to adapt the use of this codec as the voice channel during Skype or other publishers’ voice and video calls to underlying network conditions. It represents a key component to the overall availability of enhanced HD voice as IP-based communications take over the telecom infrastructure. What are the major end user benefits of using Opus? Translated to end user terms is that there is more opportunity, amongst others, for those who use Skype for “remote” music production and training. Of course it also means more robust support of the crystal clear voice conversations currently supported by SILK. 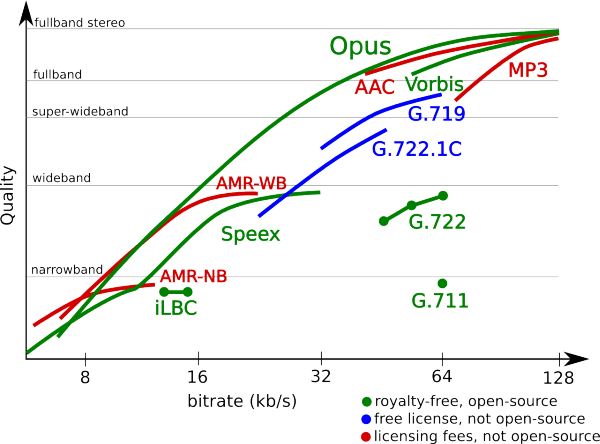 The role of Opus in the Microsoft/Skype CU-RC-Web proposal to the W3C WebRTC working group. Bottom line: Opus provides an opportunity through an industry recognized standard that addresses several issues related to Internet voice communications: transmitting the entire audio hearing range of the human ear; adapting a conversation to the underlying network conditions and providing the hardware and telecom interconnections required to allow end-to-end crystal clear conversations and audio in any call. Its actual deployment will take a few years to implement but at least there is now a common reference point. Obviously Skype has the opportunity to become one of the first application developers to implement Opus. Part I covers the discussion down to “inclusion of Opus in Skype clients”; Part II starts with the discussion of the role of Opus in the webRTC specification.